This is fresh Ajwa dates from Al Madinah in sealed box. Net weight: 500g. Manganese 4.9mg. Potassium 798mg. Calcium 168 mg. Sodium 10.1 mg. Magnesium 53.3mg. Zinc 1.2mg. 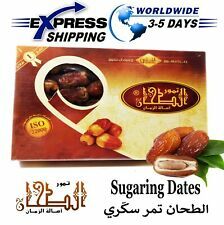 700 Grms Organic Sukkary Sugaring Dates Suadi Arabia Qassim. Sugaring ( Sukkary) Dates has a hard texture which makes it a kind of candy, So It's an excellent source of natural sugar. Ramadan Eid Foods. 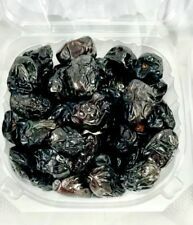 Ajwa dates from the holy land, premium quality. Ajwa fresh dates contain high fiber, vitamins, and minerals. 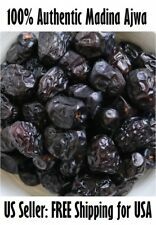 Organic Pitted Deglet Nour Dates 1kg by Hatton Hill Organic. Organically grown in Algeria. Certified organic by the Soil Association. Finest quality Jumbo Dates. Sodium 1 mg. Cholesterol 0 mg. Saturated fat 0 g. Total Fat 0 g. Fiber 1.6 g. Carbohydrates 16 g.
100% PURE & NATURAL ORGANIC - DEHYDRATED DATES FRUIT SLICES. DEHYDRATED DATES FRUIT SLICES. OSMOSIS DRYING - In this process the fruit gets mixed with almost 300% of sugar concentrated solution and then dried so you get sugar coated infact sugar loaded fruit slices with most of its essential nutrients stripped off. You can enjoy eating them as is or cut them open to be stuffed with other treats like walnuts, almonds or whipped cream. The possibilities are endless! These top-quality dried chopped dates are a very handy for baking, boosting porridges, cereals, desserts and sweet snacks. Pick some up if you like chewy, mouth-wateringly sweet food that's rich in purely natural, body-friendly sugars. Or if you want a brand new natural confectionery to please yourself and all your friends and family. 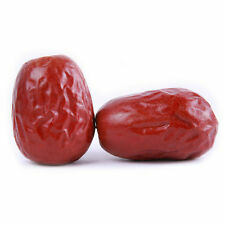 They are handpicked to ensure that each date is perfect in size and color. Magnesium 50 mg. Potassium mg. These dates once graced only the tables of Arabia's royal palaces. per 100g of dry dates. Key Product Features. 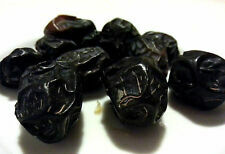 This is fresh Ajwa dates from Al Madinah in sealed box. Net weight: 2 x 500g (1KG). Manganese 4.9mg. Potassium 798mg. Calcium 168 mg. Sodium 10.1 mg. Magnesium 53.3mg. Zinc 1.2mg. Here at Forest Whole Foods we do our very best to keep our costs low and our quality high. This is so we can provide a service to people who want to feed themselves and their families with honest, healthy foods that don't cost the earth. Made with 100% organic (and delicious) dried dates - this sugar is a must-have product for any health conscious, sweet food lovers. Consisting entirely of natural sugars, this wonderful sugar substitute will not only impress your friends and family, but is guaranteed to imbue your sweet recipes with a unique and beautiful flavour. Pars Dates Fresh Iranian Dates Soft Smooth Sweet. Serving suggestions: These delicious dates are traditionally served together with a cup of coffee, but they can also make a unique dessert. Just replace the seed with an almond and sprinkle the date with caster sugar. Madina Khudry Dates. Net weight: 700g. Nutritional Facts (serving size 100g) Calcium 6%. Cholesterol 0 mg. Sodium 1 mg.
Organic Date Sugar 500g made from powdered dates by Hatton Hill Organic. Organically grown in Tunisia. Certified organic by the Soil Association. Large Amber dates, premium quality. 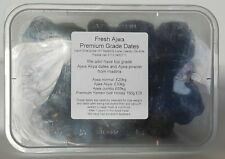 C-TS030 2017 good date china dates Dates premium organic jujube yu-date chun dates beauty 250g. 100% Natural Green Food. Organic Chopped Dates 1kg by Hatton Hill Organic. Organically grown in Tunisia. Certified organic by the Soil Association. Organic Deglet Nour Dates (Pitted). 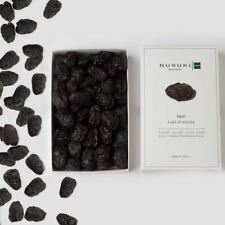 Ingredients: Organic Deglet Nour Dates (Pitted). 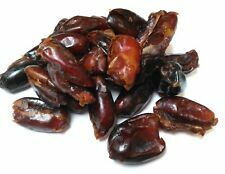 Organic Deglet Nour Dates (Pitted) are sweet and delicious. They are soft enough to snack on straight from the bag or blend well into a range of healthy recipes. Organic Chopped Dates 500g by Hatton Hill Organic. Organically grown in Tunisia. Certified organic by the Soil Association. 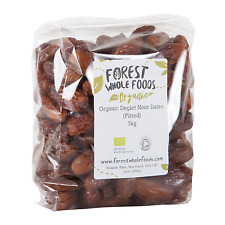 Organic Pitted Deglet Nour Dates 500g by Hatton Hill Organic. Organically grown in Algeria. Certified organic by the Soil Association.